I am using a ListView to display some images and captions associated with those images. I am getting the images from the Internet. Is there a way to lazy load the images so while the text displays, the UI is not locked up and images are displayed as they are downloaded? The total number of images is not fixed. I made a simple demo of a lazy list (located at GitHub) with images. create only one instance of ImageLoader and reuse it all around your application. This way image caching will be much more efficient. It may be helpful to somebody. It downloads images in the background thread. Images are being cached on an SD card and in memory. The cache implementation is very simple and is just enough for the demo. I decode images with inSampleSize to reduce memory consumption. I also try to handle recycled views correctly. @Richard AsyncTask maintains it's own pool so no real difference there. @kharles if you use ImageLoader in multiple activities you can only call stopThread in Application onDestroy(). It's huge, it's blurred and screen is pulsating while it's connected to dock. compare: bayimg.com/NamgKaADP vs bayimg.com/oAMggAAdP (that one is linkuniversalimageloader It's just too big for tablets, biggest advantage of tablet - big screen=more information is pointless with lazylist. 2 questions/problems: 1. This doesn't seem to handle the native heap problem in pre-honeycomb. So it's possible to get out of memory errors. Do you have a solution for that? 2. Just curiosity, Why are you not using the LruCache? It's available in all apis (with compatibility package). Thanks. @BruceHill There's no photosQueue in the latest source code. You seem to be using some very old version. I would like to receive a notification when the image download process was finished..
@MrBr like a callback ? @vrunoa Yes. Something like that so I can react to the completed download transfer and execute dependent tasks. Anyone knows how to use it for local images?? @Fedor I have some issue with your suggested link on GitHub please reply to it.. Some explanations of the key features of the linked code would be nice. 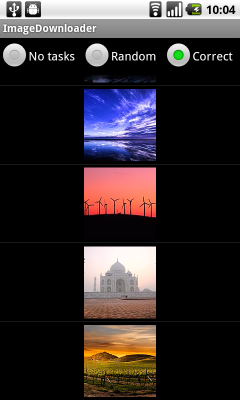 Here's what I created to hold the images that my app is currently displaying. Please note that the "Log" object in use here is my custom wrapper around the final Log class inside Android. Log.d(this.getClass().getSimpleName(), "got a thumbnail drawable: " + drawable.getBounds() + ", "
+ drawable.getIntrinsicHeight() + "," + drawable.getIntrinsicWidth() + ", "
Don't you miss a return when drawableMap contains the image ... without starting the fetching-thread? This code has several problems. Firstly you should cache Drawables, that will cause a memory leak: stackoverflow.com/questions/7648740/… . Secondly the cache itself is never cleared so it will grow forever, that's another memory leak. this causes images to get the wrong image sources in a listview. For example I have icon 1 , 2, and 3. My list shows icon 1 and two 3 icons when using this drawable manager class. Does anyone know how this is fixed from this exact code above? I think the code example didn't handle recycled views correctly. Did it? This code doesn't handle memory leaks. And it's not performed for listviews as well. 1. Picasso allows for hassle-free image loading in your application—often in one line of code! Just one line of code! 3. fresco is a powerful system for displaying images in Android applications.Fresco takes care of image loading and display, so you don't have to. It takes care of everything, You just need to put your desired design code in nested manner in shimmer frame. Here is a sample code. And here is the java code for it. Add this dependency in your gradle file. Here is how it looks like. Use the glide library. It worked for me and will work for your code too.It works for both images as well as gifs too. I found the Glide as better option than Picasso. I was using picasso to load around 32 images of size around 200-500KB each and I was always getting OOM. But the Glide solved my all OOM issues. Sure, Picasso stores full image size for cache, while Glide stores optimized images only. In addition to your description, please include some code to further improve your answer. use below class to download and load images in listview.It caches every images once download. Also loads images ad lazy loading. // threads operating off a shared unbounded queue. // Find the correct scale value. It should be the power of 2. There are four basic ways. Volley's Lazy Loading library => From guys at android. It is nice and everything but is poorly documented and hence is a problem to use. Picasso: A simple solution that just works, you can even specify the exact image size you want to bring in. It is very simple to use but might not be very "performant" for apps that has to deal with humongous amounts of images. UIL: The best way to lazy load images. You can cache images(you need permission of course), initialize the loader once, then have your work done. The most mature asynchronous image loading library I have ever seen so far. All above code have their own worth but with my personal experience just give a try with Picasso. Picasso is a library specifically for this purpose, in-fact it will manage cache and all other network operations automatically.You will have to add library in your project and just write a single line of code to load image from remote URL. A powerful image downloading and caching library for Android. Images add much-needed context and visual flair to Android applications. Picasso allows for hassle-free image loading in your application—often in one line of code! Handling ImageView recycling and download cancellation in an adapter. Complex image transformations with minimal memory use. Automatic memory and disk caching. Glide is a fast and efficient open source media management framework for Android that wraps media decoding, memory and disk caching, and resource pooling into a simple and easy to use interface. Glide supports fetching, decoding, and displaying video stills, images, and animated GIFs. Glide includes a flexible api that allows developers to plug in to almost any network stack. By default Glide uses a custom HttpUrlConnection based stack, but also includes utility libraries plug in to Google's Volley project or Square's OkHttp library instead. Glide's primary focus is on making scrolling any kind of a list of images as smooth and fast as possible, but Glide is also effective for almost any case where you need to fetch, resize, and display a remote image. Fresco is a powerful system for displaying images in Android applications. Fresco takes care of image loading and display, so you don't have to. It will load images from the network, local storage, or local resources, and display a placeholder until the image has arrived. It has two levels of cache; one in memory and another in internal storage. 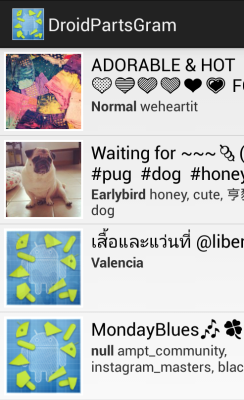 In Android 4.x and lower, Fresco puts images in a special region of Android memory. This lets your application run faster - and suffer the dreaded OutOfMemoryError much less often. Well, image loading time from the Internet has many solutions. You may also use the library Android-Query. It will give you all the required activity. Make sure what you want to do and read the library wiki page. And solve the image loading restriction. It should be solve your lazy loading problem. of course, you should always cache your images to avoid extra operations, you could put your images in a HashMap array, check if the image exists in the array, if not, proceed with the thread or else load the image from you HashMap array. Also always check that you are not leaking memory, bitmaps and drawables are often heavy on memory. It is up to you to optimize your code. I like getting the bitmap in a different thread, of course. But the only issue I have with having this code in getView() is there will be many threads running for several images. And getView may try to load many or several images at one time. This can be added into an ArrayAdapter's getView(...) method very easily. You must try this Universal Loader is best. I am using this after done many RnD on lazy loading . I recommend open source instrument Universal Image Loader. It is originally based on Fedor Vlasov's project LazyList and has been vastly improved since then. Really great work, but it lags a little bit my listview. If you could tell the best performace 'ImageLoader' build ... or maybe it's because the 'DisplayImageOptions'. I love this gridview so much but I can't use it for my tutorial. i am a beginner of android. I make application about gridview but my application was targetSdkVersion 15 so I need to use Asynctask for process in background thread. I used to use this gridview but it doesn't work. how can I use it in targetSdkVersion 15? great piece of code, but can i have progress dialog, stub and the image shown. Progress dialog if image is downloading and stub if not available??? @NOSTRA does this works for inbuilt images in the app?? Yes, UIL supports images from drawables, assets or content provider. Read Readme. Does any one here know how i can use this library for local files or Uri from MediaStore?? After reading the official android docs and trying to do this stuff myself, I'm pretty certain this library is the end all be all of image loading. Cannot upvote enough. This seems like a great resource but I have no earthly idea how to actually use it. There are tons of files and settings in this thing compared to LazyList. Some answers have already mentioned using various image libraries like Universal Image Loader and androidimageloader etc. This is an old quesion but for anyone still looking for something like this, there are several such libraries for image loading/caching. You can try the Aquery Android library for lazy loading image and listview... The below code may help you..... download library from here. URLImageViewHelper is an amazing library that helps you to do that. Give Aquery a try. It has amazingly simple methods to load and cache images asynchronously. I can recommend a different way that works like a charm: Android Query. It's very fast and accurate, and using this you can find many more features like animation when loading, getting a bitmap (if needed), etc. I had this issue and implemented lruCache. I believe you need API 12 and above or use the compatiblity v4 library. lurCache is fast memory, but it also has a budget, so if you're worried about that you can use a diskcache... It's all described in Caching Bitmaps. //Where the first is a string and the other is a imageview to load. // int in its constructor. // Use 1/8th of the available memory for this memory cache. I have been using NetworkImageView from the new Android Volley Library com.android.volley.toolbox.NetworkImageView, and it seems to be working pretty well. Apparently, this is the same view that is used in Google Play and other new Google applications. Definitely worth checking out. DroidParts has ImageFetcher that requires zero configuration to get started. Uses a disk & in-memory Least Recently Used (LRU) cache. Supports modifying bitmaps in background thread. Has image loading progress callback. When you need to put something like "Loading image..."
When you need to show the downloaded image. I also improved the ImageLoader by implementing a singleton in this object. I think this issue is very popular among Android developers, and there are plenty of such libraries that claims to resolve this issue, but only a few of them seems to be on the mark. AQuery is one such library, but it is better than most of them in all aspects and is worth trying for. Multithreading For Performance, a tutorial by Gilles Debunne. A hard, limited size, FIFO cache. A soft, easily garbage collect-ed cache. A placeholder Drawable while you download. It works fine in 2.1 as well. Just don't use AndroidHttpClient. @thomas-ahle Thank you, I saw AndroidHttpClient was giving errors in 2.1, as it's implemented from 2.2, but didn't really tried to find something else to replace it. @Adina You are right, I forgot. However there is nothing in the recipe that can't just as well be done with a normal HttpClient. I have heard at several places , that Google does not recommend soft references because the android kernel is very eager to collect these references compared to the earlier versions of the system . // Is the bitmap in our memory cache? // The same URL is already being downloaded. // params comes from the execute() call: params is the url. Log.w("ImageDownloader", "Error while retrieving bitmap from "
[SOLVED] How to vertically align an image inside a div? [SOLVED] Preventing application from hanging while image is downloading? 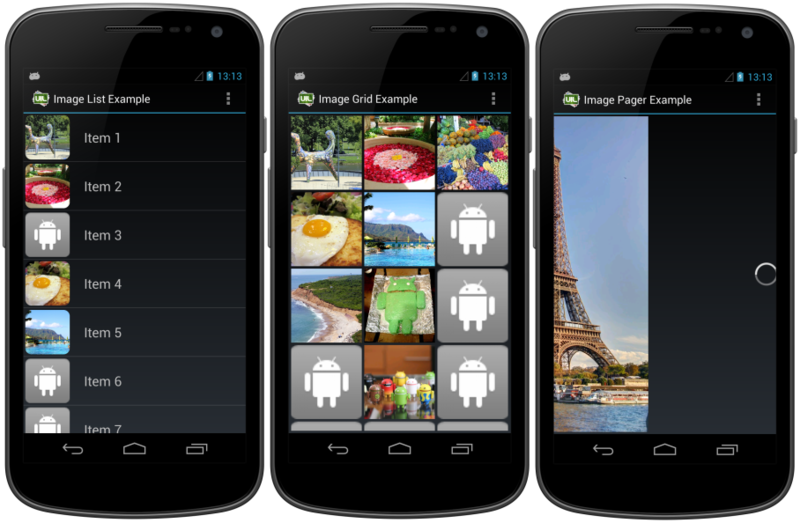 [SOLVED] How to display a list of images in a ListView in Android? [SOLVED] Lazy Load images on Listview in android(Beginner Level)? Should prefetched images still be lazy loaded into a ListView?